Save the planet or sleep? On a sweltering hot 34�C day when Ontario’s electricity system operator has asked for people to voluntarily reduce air conditioning usage, the idea of opening windows sounds like a good idea. Do we open the windows and get blasted by the noise? 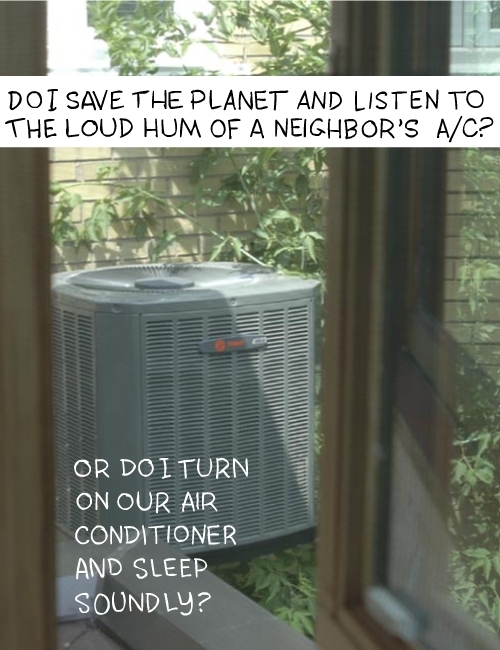 Or do we keep them shut and turn on our air conditioner? Even though the days have been very hot recently (and we do use our A/C set at around 25� or 26�), the nights have cooled down to about 20�C — perfect for open windows and a gentle breeze. But we can’t open our bedroom windows because of the noise. Arghh!! So we’ve been forced to come up with a compromise solution. Thankfully we have skylights and we open them to release some of the hot air that’s drifted upstairs during the day. Having our windows open would be so much nicer… Long term, the only real relief we’ll get is if we build a sound barrier between us and the dreaded A/C monster outside. It’s tough to have a green conscience. Sometimes I wish it — and the neighbor’s A/C — would just be quiet! I always wonder how folks in the olden days survived the heat – I live in an old victorian on the second floor and it gets seriously hot up here — how did they do it when they lived here in 1901 ?? Then again they didn’t have global warming. I have been thinking about you, appreciating the blogging medium – I have been live 3 weeks now!! I have been delving into other folks blogs and reading and reading and reading —yours included. I just love it!! My neighbor has two evangalists blaring from her home – one on the radio and one on the TV – really really LOUD, my mom called that noise pollution. We prefer her noisy airconditioner!